A lightweight electric chainsaw designed for tough, professional use. The MSE 250 C-Q offers professional-grade cutting power that is quiet, lightweight and durable. With its soft grip handle, coasting brake and temperature LED indicator, this chain saw helps give professionals precise, comfortable cutting without the exhaust emissions. And no gasoline engine means no fuel costs or seasonal engine maintenance. The MSE 250 C-Q is great for trimming jobs and firewood cutting. If you’ve got access to a 20A power source nearby, you’re ready to work. 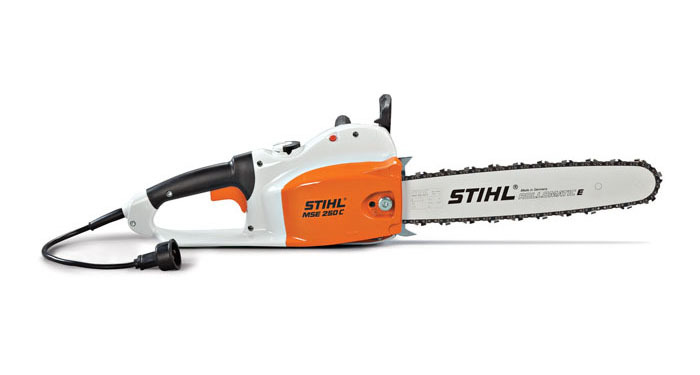 STIHL QUICKSTOP®: STIHL chainsaws are equipped with a chain stopping system designed to reduce the risk of injury in certain kickback situations. It is called a STIHL Quickstop® chain brake. The STIHL Quickstop® chain brake is designed to stop the rotation of the chain if activated by the operator’s hand or by inertia if the saw kicks back with sufficient force. In some working positions, the STIHL Quickstop® chain brake can be activated by inertia, stopping the chain within fractions of a second. STIHL QUICKSTOP® PLUS (Q) - AN ADDITIONAL CHAIN BRAKING FEATURE:STIHL offers an additional, manually-activated chain brake on some models. This system is designed to engage when the operator’s right hand completely releases the rear handle, stopping the chain within one second.